Coimbra is a district capital, the largest city of the Centre Region of Portugal with around 150,000 inhabitants. The city is near to both the mountains and the sea: 40 minutes away from “Serra da Lousã” – which belongs to the European network of protected areas, famous for its schist villages – and 2h30 away from “Serra da Estrela” – the highest mountain of Continental Portugal, well-known for its snow sports and local gastronomy. The beautiful beaches and seaports of Figueira da Foz and Aveiro are only 50 minutes away. The good road and railway infrastructures and the transportation network allows you to arrive at the Lisbon airport in two hours and at the Porto airport in one hour, from where daily cheap flights depart to the several European capital cities. Travelling by car, you can arrive in Salamanca in three hours and in Vigo in two hours. From Coimbra train station B you can take international trains to Madrid and Paris. The city is located on the banks of the Mondego River, where you can practice open-air sports or just relax on the grass. Especially in the downtown area, there are a lot of trees, parks, gardens and public squares. Coimbra also has some forest reserves such the “Mata do Choupal” and the Botanical Garden. Coimbra has remnants of 2,000 years of history. Roman Empire constructions coexist with internationally renowned modern buildings. Capital of the Portuguese Kingdom in bygone ages and meeting point of several cultures, Coimbra combines a rich architectonic and historical heritage with modern facilities for the arts and sports and green, open-air spaces. The city and the university are classified as World Heritage since June 2013 and have a thriving cultural life offering a great diversity of literary talks, exhibitions, cinema cycles, music and dance shows, theatre plays and other performances.The City Festivities, the Arts Festival, the jazz festival "Jazz ao Centro" and the Cultural Week of the University of Coimbra are just a few examples of the events that take place every year and are really worth to see. World famous music artists such as Madonna, U2, Rolling Stones, among others, have performed in the Coimbra city stadium. 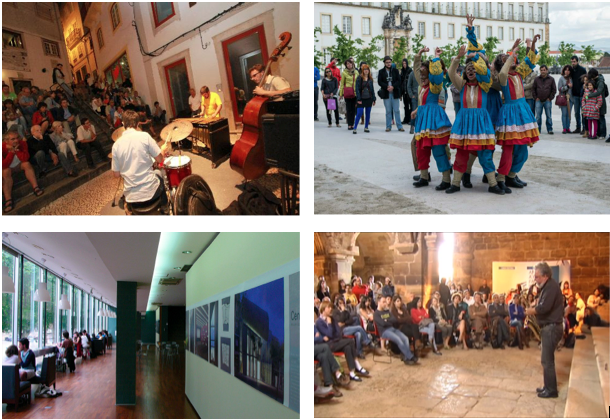 More often, you can listen to jazz and classical music in the several show rooms scattered over the city (Gil Vicente Academic Theatre, Centro de Portugal Pavillion, Municipal Theatre, etc. ), but also in gardens (Sereia Garden, Quinta das Lágrimas’ gardens) and other open-air spaces near emblematic monuments (Old Cathedral, Monastery of Santa-Clara, Church of Santiago, Monastery of Santa Cruz, etc.). For the lovers of fado, rock and pop, there are several cafés and bars that enliven the city at night: Diligência Bar, À Capella, Bar Quebra, The Rocket Planet, Aqui Base Tango, AAC Bar, etc. There are also several popular events, such the student festivities “Latada” (new students’ parade) and “Queima das Fitas” (graduate students’ parade), book and handicraft fairs, flower and aromatic herbs’ market, magic shows, and the famous Medieval Fair, which recreates the atmosphere of the period, from the clothing and the food to the entertainment and the sale of typical products. In the area of sports, for the quality of its sports’ facilities (Multi-sports’ Pavilion, Coimbra City Stadium, University Stadium, Horse Riding Centre, AAC Nautical Sports Section, Olympic Swimming Pools’ Complex, Mondego Swimming Pools, among others), and the excellence of the UC student athletes, the European University Sports Association chose Coimbra to be the organiser of the European University Games of 2018. The event is expected to host 4500 athletes and 2000 participants from all over Europe, representing more than 400 universities. In Coimbra there are two major shopping centres with supermarket, large shops with national and international world-known brands, services and cinema rooms: Alma Shopping (previously known as Dolce Vita) and Forum Coimbra. 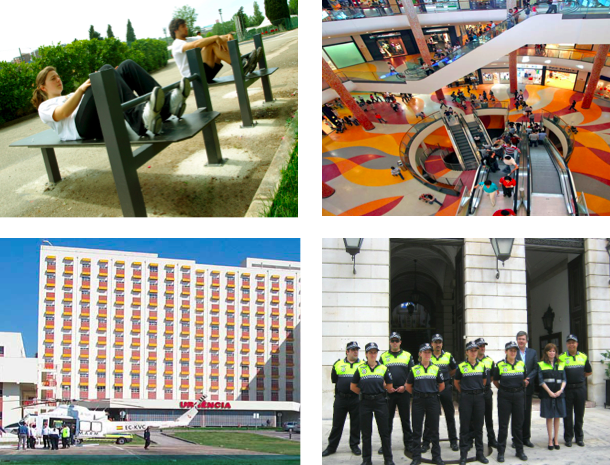 Besides these two shopping centres, there are other commercial facilities spread all over the city such as Atrium Solum, Girassolum or the Coimbra Shopping. The downtown area (“Baixa”) is a traditional centre of commerce, with restaurants, cafés, bakeries and patisseries, and a variety of little shops with traditional products. 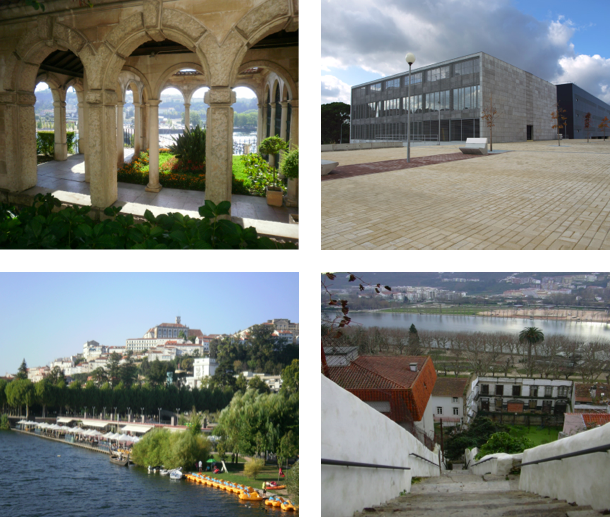 Coimbra is a safe university city, with good transports, several accommodation options and an excellent public network of health care services. There are a number of public health units in the city, namely health centres and the hospitals of the University of Coimbra (CHUC), the largest health care centre in Portugal. There are also several pharmacies that sell prescribed and non-prescribed medicines and other health and beauty products. The University of Coimbra itself offers medical assistance in its health facilities located in the campus I. The city also has civil protection services and fire fighters involved in the prevention of risks and rescue operations.